The last time a modem was advertised as a thing in its own right was probably towards the end of the 1990s, when the pinacle of dial-up - the 56K modem - came out. Before then, there was still a bit of an arms race as manufacturers strove to squeeze as much out of acoustic technology as they could, as prior to ADSL speeds were limited to what the voice circuit could carry, and this had never been famous for its bandwidth. The first modems used acoustic couplers and could run to 150-300 baud, but by the time of this advert speeds were up to 2400 bits per second, or roughly 240 characters per second. The carrier for these V.22bis modems was still only running at 600 baud, but they used a "quadrature" modulation which meant they could carry four bits per baud, giving the total throughput of 2.4kbps. To put that into context, the BBC's homepage as at the end of March 2017, which weighed in at 1.9MB, would take 134 minutes, or just over two hours to download, even using a state-of-the-art modem. This particular modem probably also won the competition for most knobs and lights and seemed to cover just about every possible combination from 300 baud, 1200/75 (Prestel/Viewdata) up to 1200 V.23 including incoming and outgoing connections. It was all a lot more complicated than modern broadband which is perceived as being "just on". Despite all that, the advert shows again that even in 1985 it was possible to connect to a world-wide network including Prestel, Micronet, bulletin boards and even Telex. 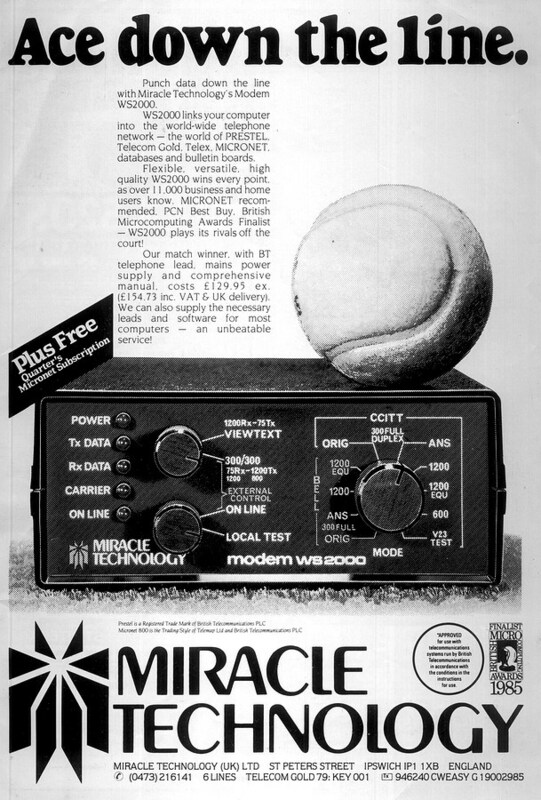 It cost £154 - about £470 in 2019 money, whilst one of Ipswich-based Miracle's other modems - the V22.bis version of the WS3000 - cost an eye-watering £750, or about £2,290 in 2019 money . At the end of 1987, Miracle moved in to brand-new £750,000 premises in Ipswich and was making 20,000 modems a year. Its WS2000 was by now considered a "classic", whilst its V22.bis modem had now come down to a slightly-more-affordable £545, or around £1,520 in 2019. The company had recently received a boost when it won a major retail deal with Tandy, which took 500 of the company's WS2000, 3000 and 4000 modems to sell in its 280 UK stores. Miracle's marketing manager David Baxter said of the deal "This is our first foray into the arena of mass marchandising via the UK high street and our exclusive arrangement with Tandy opens up markets we could not otherwise cover".